CNN has confirmed that Bil Keane, artist and creator of beloved long-running comic "The Family Circus," died Tuesday at his family's home in Paradise Valley, Arizona at the age of 89. His son Jeff tells CNN that the cause of death was congestive heart failure, which Jeff says his father suffered from "for quite a while." In a post on his website that demonstrates the Philadelphia native's particular brand of humor, Keane recounts that he taught himself to draw and began cartooning in high school. He met his wife, who passed away three years ago, while stationed in Australia during World War II. The couple wed in Brisbane, and then "in Roslyn, Pa., we started our real-life family circus. They provided the inspiration for my cartoons; I provided the perspiration." In 1959 Keane and his family relocated to the Paradise Valley home in which he died, and that's also the location where he created the "Family Circus." He has illustrated the humorous realities of familial life since 1960, and the comic strip today appears in over 1,500 newspapers. Jeff, Keane's youngest son, tells CNN that he's worked with his father on the “The Family Circus" since 1981 and will continue the cartoon. Keane leaves behind Jeff and his four other children, Gayle, Neal, Glen and Christopher; nine grandchildren and one great granddaughter, "who brought great joy to his life," Jeff said. My condolences to his family and friends. Most importantly my thoughts and prayers go out to them. A little less importantly, I would just like to say I love the Family Circus cartoons. They often bring light, a smile, and a lesson into life. Also, it is one of the few cartoons left that can be shared with all family members. I hope his legacy will live on and I am glad to hear his son will contnue the cartoon. Again, my thoughts and prayers go out to his family and friends and heaven just got a little brighter. I remember reading the "Family Circus" every Sunday in the Sunday paper growing up. It was on the front cover of the paper. RIP Mr. Keane. 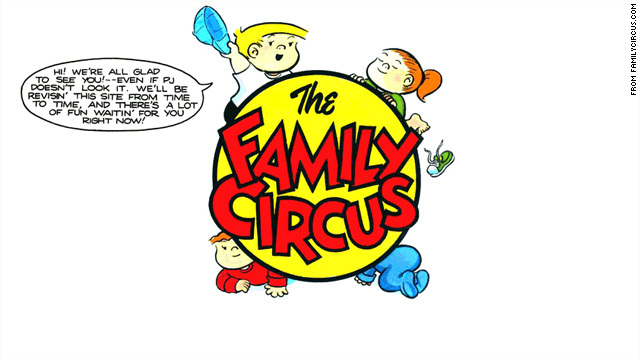 Family Circle is a lovely comic strip and we have been fortunate to have it around as long as we have. Rest in peace, Bill Keane. Thanks for all the lovely memories and simple insights into family life and love. I loved reading Family Circus every morning and glad to hear that it will continue on. U dum azzs read the article-his son will continue the comic. Sheesh ! R I P BK. He made millions of people smile every week. He was a Great cartoonist. I only wish they would have brought this wonderful cartoon to life, with a movie or a series instead of this other crap they have out their now. Rest In Peace Mr keane. your work will live on. Family Circus has been drawn and captioned for the last 3 or 4 years by Jeff. Dont think its going anywhere. I also dont think you really appreciate it til you have kids yourself! Love it! You're wrong there, friend. You don't have to have kids to enjoy it. I think we can see ourselves in one or two circles. Love Family Circus. Very insightful. Keane was truly successful in life. Rest in peace sir, you will be missed. Yours was a strip that was up there with "Peanuts" for quality and longevity. Hopefully most papers will run repeats. Made me smile pleanty Bill K. RIP good sir and WWII survivor maybe your son carry on this legacy! Thank you for jeffy, dolly, pj, kitty cat, and all the gang. You brought us back to a simpler, better time. You will be missed our good friend. As lame as you are. I'm sure many would disagree with your critique of the comic strip. But more importantly it was probably a poor place to vocie the critique. Probably a place to remember: "if you can't say anything nice, don't say anything at all." Take care. Major league buttock. You must be miserable. A 'lame' cartoon doesn't run as long as his has. I love the comics and am trying to burn them on CD-Rom one by one so-God forbid-there is a disaster I'll have them. As much as I love Charlie Brown, Family Circus was better.